My infectious disease specialist convinced me to get hepatitis A and B vaccines since I’m single and potentially sexually active. I’m guessing she didn’t want to ask if I was sexually active. She said the vaccines were covered by most insurance. She also recommended a pneumonia vaccine given my HIV status and age. I agreed. I had a series of shots in April and May. The final round is due this month. Color me surprised when I received a bill for $455. The shots were not covered by my insurance even though I pay a $900 monthly premium. Apparently, that $900 a month pays for less than stellar coverage. Added to my joy is knowing I’ll receive a bill for another $250 for the final round of shots. I’m trying to convince myself it’s just another expense of being single. It’s like paying more taxes on a high income when you file as single with no dependents. Cy Twombly is one of my favorite artists. He died in 2011. He was part of the generation of artist that included Robert Rauschenberg and Jasper Johns. Cy was painter, sculptor and photographer. I feel he was under appreciated. 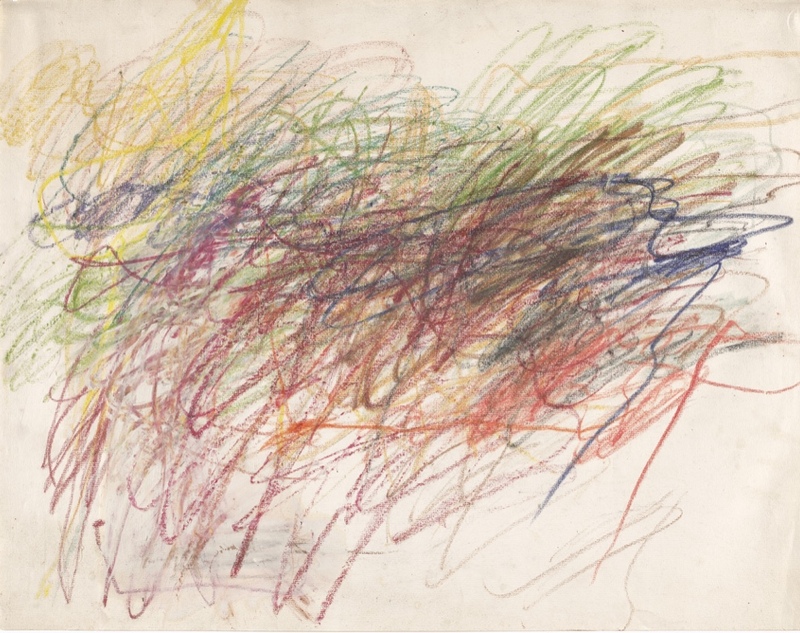 Cy Twombly, untitled 1954, gouache, wax crayon and colored pencil on paper, 19 x 27. Collection of MoMA, New York. Why Are Some People Lazy? I was texting with Mike on Wednesday afternoon. He was at his office and I was at home. He had heard the house next door to his old house recently sold. He asked me to google the sale price. Seriously? Mike is sitting in front of a computer and texting me on an iPhone, yet he asks me to search for the sale price. It’s the height of laziness. He could merely ask Siri or google it himself, or he could have his assistant look it up. I didn’t bother to look. I waited a few minutes and told him the price wasn’t posted yet. Denver received its first snow of the season yesterday. It was a minor snow of just an inch or two in my part of town. The temperature never made it above freezing. Wolf Creek Ski area opened a few days ago with 27 inches of snow. They were the first ski area to open in the nation. Winter sport season has started. It’s going to be a long season. I finished watching Hinterland on Netflix. The noir crime drama set in Wales only has 13 episodes. Oddly, guns were only shown in the last episode even though it’s a crime drama with at least one murder in every episode. This is so unlike American crime dramas. I guess that’s to be expected given the uncontrolled gun culture in America. The series is beautifully filmed. It made me add Wales to list of places to visit. The downside is the weather. It seemed to be constantly raining and cool. The charters were always wearing sweaters and coats. Of course this could the result of the timing of the production schedule. The main detective drove a black Volvo which was always dirty as a result of driving down many unpaved roads. On the plus side, Wales seems to be unbelievably scenic with beautiful coastlines, rocky beaches, rolling hill, forests and grasslands. It seems like fall lasted ten minutes here. Yesterday, parts of the high country had a foot of snow. In the city, it’s been in the 30’s with occasional snowflakes falling. The last few days have been cool and rainy. I turned off the swamp cooler yesterday. The irrigation system gets blown out on Saturday, which, is a good thing given the low on Sunday is expected to be in the teens.